Handsome very large Mid-Century Modern ceramic table lamp with a gorgeous turquoise lava glaze and its original shade done in the style of the famed Fantoni. This great lamp is in wonderful vintage condition as is the large drum shade. Please see photos. circa mid-20th century. You light up my life….you give me…..oops! You caught me singing again. But this lamp is so very wonderful it just makes me happy. Unsigned but done in the style of Fantoni this lamp could be a star in any room. Maybe design the room around the lamp. Comprised of a tall vase shaped ceramic base in one of the most gorgeous colors of turquoise green I’ve ever seen. Not to mention the magnificent lava glaze. And then there is the original drum shade. Some may wish to replace or update this shade, but I love it. It is equally as tall as the base and covered in a nubby linen-like fabric with a self-trim on the upper edge that has a turquoise velvet ribbon in the middle. It has a 3-way switch. And it is in awesome condition. All in all, this is just a perfect lamp for your Mid-Century Modern home. Or maybe in your Industrial loft or modern country ranch house. 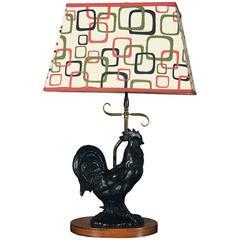 Whatever your décor, I know you will love this lamp. Make it yours. 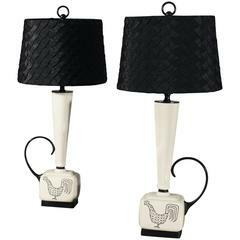 Lamp: • O/A height to top of shade – 40.5 inches • Height to top of socket – 25.5 inches • Height to top of base – 19.75 inches • Base diameter – 8.5 inches • Shade size – 14.5 d x 19 h inches • Weight with shade – 10.6 pounds Boxed size: • Height – 52 inches • Width – 18 inches • Depth – 18 inches • Weight – 20 pounds. This great lamp is in wonderful vintage condition as is the large drum shade. Please see photos. 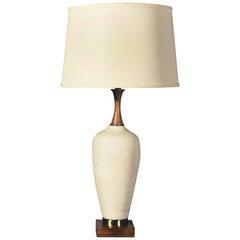 By Navis & Smith Co.
Gonder Pottery, Navis & Smith Co.
Isamu Noguchi, Modeline Lamp Co. This is a magnificent 1960s turquoise blue lava drip glazed ceramic table lamp on walnut wood base. Mid-Century Modern table lamp in crackled turquoise glazed ceramic and it sits on a satin finish stainless base with the same sockets and accents. Mid-Century modern scandinavian lamp in ceramic with original shade in linen. New electrical system brought up to EU standard. E27 bulb.